Enjoy Country Club Living Without the Country Club Expense. Membership Not Required. 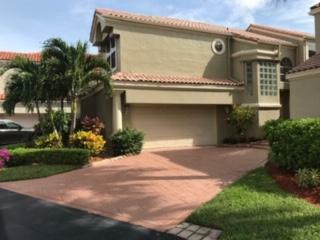 This Gorgeous Zero Lot Line Single Family Home is Located in Prestigious Boca Raton Country Club. This Newly Renovated Home Boasts Stunning New Wood Floors, New Renovated bathrooms Including : Vanities with New Sinks and Faucets, Mirrors, Tiling, Toilets and lets not forget the Brand New Guest Bath Tub. Loft could be converted to 4th Bedroom, Plumbing has been Updated. Pool just Refinished with Diamond Bright Including Sting Ray Tile Mosaic . Brand New Garage door with Brand New Opener , Brand New Front Door.This Home Truly Is In Move In Condition. Come Decorate and Personalize this Beautiful Home to make it Your Own!